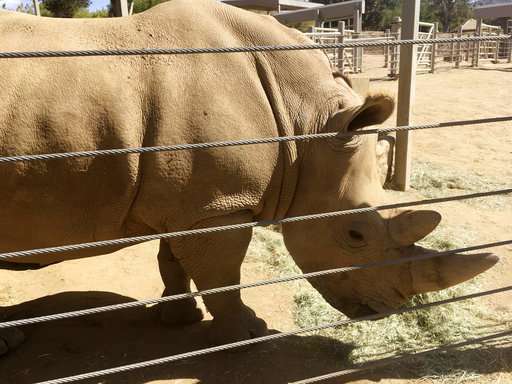 A southern white rhino has become pregnant through artificial insemination at the San Diego Zoo Safari Park—giving hope for efforts to save a subspecies of one of the world's most recognizable animals, researchers announced Thursday. If she does, researchers hope someday she could serve as a surrogate mother and could give birth to the related northern white rhino, whose population is down to two females after decades of decimation by poachers. The mother and daughter northern white rhinos live in a Kenya wildlife preserve but are not capable of bearing calves. News of Victoria's pregnancy was confirmed two months after the death of the last northern white male rhino named Sudan, who was also at the Kenya preserve and was euthanized because of ailing health in old age. 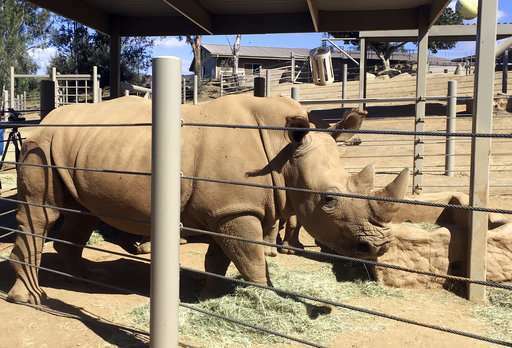 Victoria is the first of six female southern white rhinos the San Diego Zoo Institute for Conservation Research is testing to determine if they are fit to be surrogate mothers. If she and the others are deemed fit to do so, they could carry northern white rhino embryos sometime within the next decade as scientists work to re-create northern white rhino embryos. There are no northern white rhino eggs so creating an embryo would require using genetic technology. Scientists plan to use frozen skin cells from dead northern white rhinos to transform them into stem cells and eventually sperm and eggs. Then the scientists would use in vitro fertilization to create embryos that would be put in the six female rhinos. Victoria is a healthy 747-pound (1,700-kilogram) rhino estimated to be seven years old. 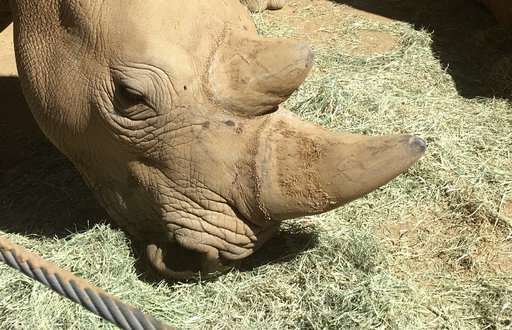 She and the other five female rhinos that range in age from four to seven years old were all born in the wild and relocated to San Diego's Safari Park in 2015. Scientists will soon start developing artificial insemination techniques and embryo transfer techniques for them. The rhinos also undergo weekly ultrasounds. While embryos have been created for southern white rhinos, they haven't been for northern white rhinos. The ultimate goal is to create a herd of five to 15 northern white rhinos that would be returned to their natural habitat in Africa. That could take decades.